Dr. Sophia Yin was a renowned veterinarian and animal behaviorist who focused her life’s work on “pet-friendly” techniques for animal handling and behavior modification. Much of her work was based on developing new standards of care for professionals across the animal care spectrum, using scientific methodology and testing to support her Low Stress Handling™ advocacy. Sadly, this pioneer of animal care advocacy passed away in September, 2014, but her good work lives on to continue to educate and inform the animal community. You think YOUR cat meows too much?! Is he a Bengal or Siamese? Believe it or not, yelling at him or hurling (soft) objects usually doesn’t work. And even though it may make your feel better, in fact doing so may make the cat worse! Yelling and tossing things at them make it clear to the cats that meowing works to get them what they want… your attention! And if it’s food that they want, they know that getting your attention is the first step! So how DO you quiet a cacophonous cryer? You follow the golden rule of changing behavior—reward the behavior you want, such as sitting quietly, and remove the reward for unwanted behavior—your attention. So when your cat yowls at you to give him what he wants, wait him out patiently and then only pet and provide attention when he sits quietly. Sounds great, right? At least it does on paper. Realistically taking those steps in that order can take forever. To speed up the process first train the cat to sit for treats and once he’s got that down, then wait him out when he’s noisy. Training cats to sit is simple. Just take a yummy treat such as greenies, canned food on a spoon or in a syringe with the tip cut off, pieces of cheese, tuna, or, if it’s mealtime, a portion of his meal. When he knows you have it and is looking at you like “How do I get THAT,” just wait until he sits and when he does, deliver the treat right up to his face. Make sure you hold it in a way that he can eat it while he’s still sitting. Once he’s done, repeat. Also, once he’s sitting, you can give him a series of treats for remaining seated. Note this is way easier for cats than dogs because cats love to sit and remain seated whereas dogs love to sit and then pop right up! Next, walk a few steps away and repeat. The goal is that every time you walk away and stop and the cat follows to catch up, when the cat catches up she quickly sits to earn a treat. Now, sit is starting to become a very rewarding behavior. 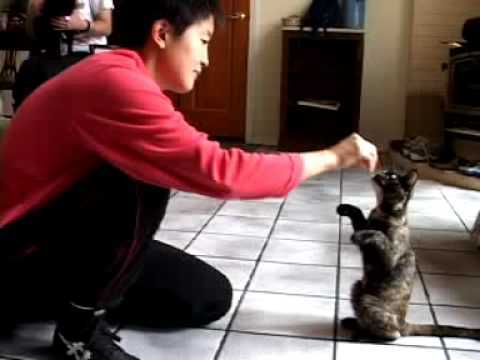 If you couldn’t get your cat to sit this way, you can also use the food as a lure to get your cat to raise her head and move her weight back to her rear. Place the treat right up to her face, then raise it and move it back so she shifts her weight back into a sit. Then hurry and reward her before she gets up. If needed, you can first reward her for just almost sitting and when she readily goes into this position then start rewarding her only when she sits all the way. What if She’s Meowing When You’re Training Sit? If your cat was meowing while your were working on sit, there are two options. You can wait until she’s quiet to reward her for sit or you can just reward her while she’s meowing now and then work in the rewarding quiet later. Generally it’s easiest to train one behavior at a time and she’ll learn to sit pretty quickly anyway—usually in a couple of 5 minutes sessions if she’s hungry, so if she doesn’t get quiet pretty quickly on her own just wait for the next step. Now that the cat has learned a calm stationary position, you can start rewarding for quiet behavior. Here’s an example with my cat Dante. Dante can vocalize longer than the most diligently trained singer but he’s learned that he doesn’t need to meow and scream whenever he wants something, instead we’ve rewarded sitting quietly. However, when something changes, such as when we have dogs visiting for a few days and he has to lay low, he seems to revert back to his meowing ways afterwards. So here’s the routine I use for a couple of days to retrain him to be quiet. Basically I wait out the long string of meows and when he’s quiet for a few seconds hurry up and reward. Dante’s a quick meower which makes it difficult to get a treat to him while he’s still quiet and before the next meow. As a result, I use a clicker and click to let him know when he’s being good and has earned a treat. At first I can have to reward him for just a 1-2 seconds of silence. But he quickly learns to be quiet for longer periods of time. In fact in the video you can see him looking around to see if it’s the head position that’s earning a reward because different head positions have worked in these training sessions in the past (link to lion head turn). He even gets confused at one point and thinks, maybe meowing does work. So he tries some quiet, tentative meows. But because I avoid rewarding the meows and then reward him when he’s quiet, he gets the message, that it’s the quiet, not the head turns or the meowing. Expect to have to wait out the meowing and reward quiet behavior many times during the day if you have a Herculean Howlers like Dante. But if you’re consistent and reward the quiet behavior with enough sequential treats for longer and longer silence, you can fix the meowing in just a few days. Because Dante’s had this training before, it took just 2 sessions of rewarding quiet behavior for him to remember to be quiet all day and the quiet, not shouting works to get him what he wants. Why would on want to quiet their kids?? They are talking to you and one should be grateful for that. My daughter is very talkative. We are always having a conversation. Don’t quiet your kids. Enjoy the time you have with them as it goes way too soon.